Aim: This study aims to propose protocols that enable scoring of mitral valve (MV) in mitral stenosis using the three-dimensional (3D) scoring system. Methods: A two-staged study was conducted. The first stage was designed to select the best 3D images of MV leaflets and chordae through analysis of 471 images. The second stage was designed to organize the best 3D images into protocols for complete scoring of MV. It included 35 consecutive patients; 23 had sinus rhythm (SR) and 12 had atrial fibrillation (AF). Both single- and multi-beat 3D acquisition from apical and parasternal windows were focused on MV leaflets and chordae using all 3D modalities (live, zoom, and full volume). To propose the protocols, 1563 images were analyzed. Results: In SR with good apical window, 2 protocols were recommended for complete scoring of leaflets and chordae (4 zoom 3D images [1 image for leaflets and 3 images for chordae] and 1 full-volume 3D image) using single- and multi-beat acquisition. In AF, the same 2 protocols using single-beat acquisition were recommended. 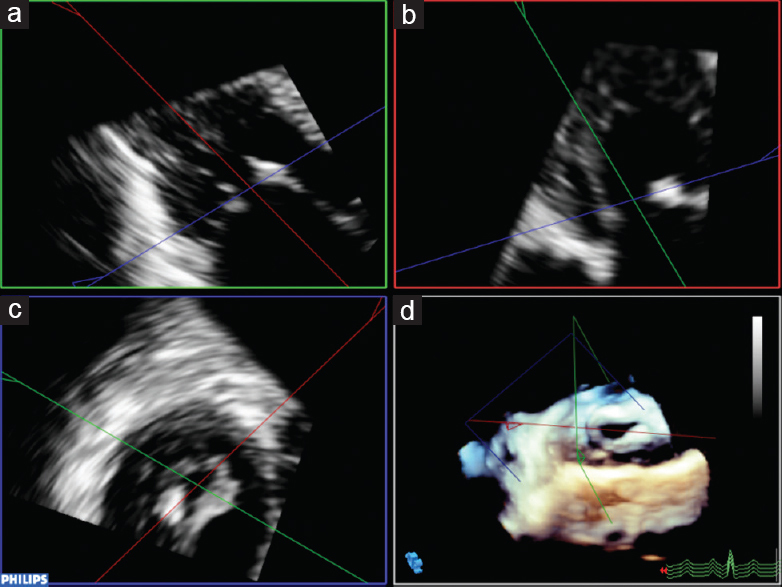 From parasternal window, complete scoring of leaflets was obtained by 3 recommended protocols (single- or multi-beat zoom 3D images from parasternal short axis [PSAX], multibeat live 3D images from PSAX, and single- or multi-beat full-volume 3D images from parasternal long axis) in SR and 1 protocol in AF (single-beat zoom 3D images from PSAX). Scoring of chordae was incomplete in all patients by all 3D modalities. Conclusions: The proposed 3D-transthoracic echocardiography protocols suit all patients regardless of echo window and heart rhythm and enabled complete MV scoring. A comprehensive morphological and functional description is needed for the optimal assessment of mitral valve (MV) in patients with significant mitral stenosis (MS) to select the therapeutic modality properly. Many scores are derived using two-dimensional transthoracic echocardiography (2D-TTE) targeting patient selection before percutaneous valvuloplasty.,, Assessment of MV using any of the scoring systems has many limitations, and none of these scores has been shown to be superior to any of the others. However, most cardiologists use the Wilkins' score., 3D echocardiography has established a clear understanding of the functional anatomy of the MV, providing a detailed analysis of the MV apparatus. The feasibility and reproducibility of the first scoring system using 3D-TTE were introduced and validated. The current study aims to describe the best image acquisition and orientation needed for MV scoring by the 3D-TTE using the latest available echo machine and analysis software. Based on the image selection, simple protocols were proposed and modified according to the echo window and underlying heart rhythm. The study was performed in two stages. The first stage was designed to select the best obtainable 3D images that help in visualization of MV leaflets and chordae. It included 7 patients with MS (mean age, 30.2 ± 6.9 years; 4 females and 3 males). Four patients were in sinus rhythm (SR) and 3 were in AF. The second stage was designed to organize the best obtainable 3D images into protocols to help complete scoring of MV. It included 35 consecutive patients (mean age 33 ± 8.4 years, 60% male) with an established diagnosis of significant rheumatic MS by routine 2D-TTE. Heart rhythm was sinus in 23 (65.7%) patients and AF in 12 (34.3%) patients. All patients in both stages underwent 2D-TTE and 3D-TTE at the same sitting using the matrix probe (X5-1) connected to EPIQ 7C machine (Philips Medical Systems, Andover, MA, USA). In both stages, 3D-TTE was performed immediately after 2D-TTE with the consideration of EAE/ASE recommendations for 3D image acquisition and display., In patients with SR, both single- and multi-beat (4 cardiac cycles) acquisitions were obtained for all 3D modalities (live 3D, zoom 3D, and full volume). In patients with AF, single-beat acquisition of live 3D, zoom 3D, and full-volume images were obtained to avoid stitching artifacts with multibeat acquisition. All images were acquired from parasternal long axis (PLAX), parasternal short axis (PSAX), and apical views (4 chamber, 2 chamber, and 3 chamber) to focus on MV leaflets. For assessment of chordae, 3D images were acquired from PLAX and apical views (4 chamber, 2 chamber, and 3 chamber). Acquisition from PSAX was not used due to difficulty to adjust the X-pane cuts at 3 levels along the chordal length by all 3D modalities. Using Live 3D, the images were acquired from PLAX, PSAX, and apical positions (4 chamber, 2 chamber, and 3 chamber) using the appropriate focus and small depth to enable displaying the MV leaflets within the small 3D sector [Figure 2]. Using live 3D, the images acquired from both PLAX and apical 3-chamber positions were adjusted to include the whole length of chordae within the small sector. Chordal thickness and separation were visually assessed without cropping due to inability to obtain short-axis slice of each third from the small volume of live 3D [Figure 5]. Poor image (not recommended) was defined as the image that enabled complete scoring of MV leaflets and chordate in low percentage (<50%) of patients or if it is unable to score more than one point of MV score (either MV leaflets or chordae). To assess the inter- and intra-observer variability, the 3D images of all patients in the first stage were analyzed twice by the two observers blinded to each other's results in two different sessions. Inter- and intra-observer agreement were evaluated using Kappa index and classified as poor (κ = 0.01–0.20), slight (κ = 0.21–0.40), fair (κ = 0.41–0.60), good (κ = 0.61–0.80), very good (κ =0.81–0.92), or excellent (κ = 0.93–1.00). All the 3D images (total of 471) obtained from PLAX, PSAX, and apical positions (4 chamber, 2 chamber, and 3 chamber) were analyzed for the ability to get a complete assessment of MV leaflets and chordae. Each image was categorized according to the definitions in method section into optimal, suboptimal, and poor. From apical acquisition, both single- and multi-beat live 3D images were poor for complete assessment of all MV scallops even with multiple acquisition sites (apical 4-chamber, apical 2-chamber, and apical 3-chamber views). All 3D images by both modalities (zoom 3D and full volume) were optimal. In PLAX, live 3D images by both single- and multi-beat acquisitions were poor to visualize any scallops in all patients. Using zoom 3D modality (single- and multi-beat acquisition), images were poor to visualize both A1 and P1 scallops. Single-beat acquisition of full-volume images was suboptimal while multibeat acquisition was optimal to obtain complete assessment of all MV scallop in a single en face view. In PSAX, full-volume 3D images by both single- and multi-beat acquisitions were poor. Multibeat live 3D images were optimal while single-beat live 3D images were poor. Both single- and multi-beat zoom 3D images were optimal and enabled complete assessment of all MV scallops. [Table 1] shows image categorization according to the definitions in method section into optimal, suboptimal, and poor. From apical acquisition, zoom 3D images using both single- and multi-beat acquisitions were optimal for complete assessment of chordal thickness and separation in all patients. Furthermore, both single- and multi-beat full-volume 3D images were optimal for complete assessment of chordal thickness and separation in all patients. Multibeat live 3D images were optimal for assessment of chordal thickness while single-beat live 3D images were suboptimal. Both single- and multi-beat live 3D images were poor for assessment of chordal separation. From PLAX, the distal third of chordae was missed that led to incomplete assessment of chordal thickness and separation by all 3D acquisition modalities. All single- and multi-beat 3D images were poor due to inability to assess the distal third of chordae. [Table 2] shows image categorization of the 3D images into optimal, suboptimal, and poor. Interobserver agreement was excellent (κ = 0.96) for the categorization of images acquired from the apical window for en face visualization of MV leaflets and very good (κ = 0.83) for chordae. For the categorization of images acquired from parasternal window, intraobserver agreement was very good (κ = 0.81) for en face visualization of MV leaflets and good (κ = 0.78) for chordae. Intraobserver agreement was excellent (κ = 0.95) for the categorization of images acquired from the apical window for en face visualization of MV leaflets and very good (κ = 0.84) for chordae. For the categorization of images acquired from parasternal window, interobserver agreement was very good (κ = 0.81) for en face visualization of MV leaflets and good (κ = 0.77) for chordae. Based on the first-stage results, all 3D images categorized as poor were excluded in the second stage. Only optimal (total of 1493) and suboptimal (total of 70) images were acquired and stored as performed in the first stage. The average heart rate during acquisition was 68 ± 8 beat/min in patients with SR and 75 ± 9 beat/min in patients with AF. The average time needed for acquisition, orientation, and analysis of single- and multi-beat zoom 3D, full-volume, and live 3D images are listed in [Table 3]. The time needed for single-beat acquisition by all modalities was 5 ± 2 s while the multibeat acquisition time ranged from 10 ± 2 s to 11 ± 3 s. The shortest time for acquisition and analysis (15 ± 5 s) was for the single-beat live 3D image while the longest time for acquisition and analysis (38 ± 7 s) was for the multibeat full-volume 3D image. The average temporal resolution obtained for all 3D modalities from the three echo windows (apical, PLAX, and PSAX) are displayed in [Table 3]. The highest resolution (75 ± 9 Hz) was obtained from multibeat live 3D images while the lowest resolution (6 ± 2 Hz) was obtained from single-beat full-volume 3D images. 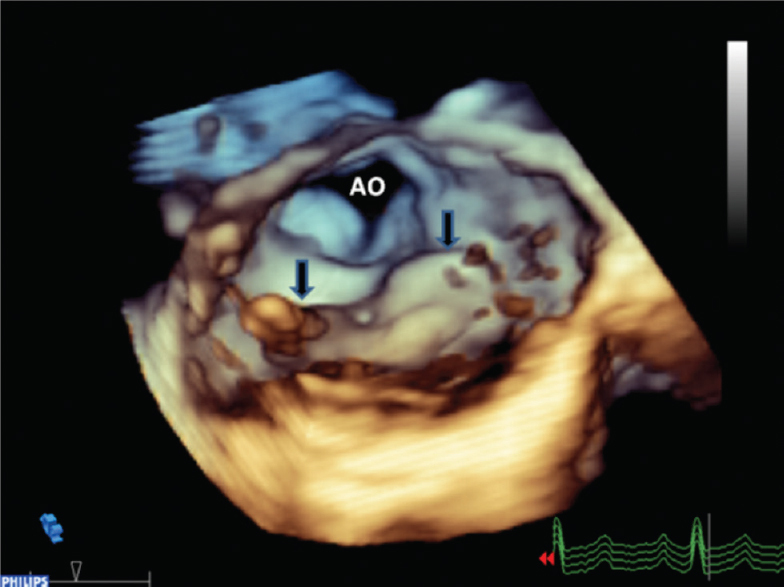 The protocols for MV scoring were proposed and classified according to the best obtainable 3D images from both apical and parasternal echo windows in both sinus and AF patients. The optimal images were included in the recommended protocols, and the suboptimal images were included in the alternative protocols (if optimal images were not possible). Multibeat acquisition for all modalities (live 3D, zoom 3D, and full volume) was selected due to higher resolution; Singlebeat acquisition can be used if there is motion artifact. Two recommended protocols were proposed for MV scoring. The first recommended protocol included acquisition of 4 zoom 3D images (1 image for MV leaflets and 3 images for chordae) from the apical position. The en face visualization of all scallops of MV leaflets was obtained equally from apical 4-chamber, apical 2-chamber, and apical 3-chamber acquisitions. For adjustment of cut planes along the length of chordae, apical 3 chamber was better than apical 4 chamber and apical 2 chamber. The average time of acquisition and analysis of the 4 single- and multi-beat zoom 3D images was 68 ± 16 s and 84 ± 16 s, respectively. The second recommended protocol included one apical acquisition of full-volume 3D images then cropping to obtain 4 en face views of MV leaflets and chordae. The average time of acquisition, cropping, and analysis of single- and multi-beat full-volume 3D images was 105 ± 22 s and 110 ± 18 s, respectively. The total time needed to obtain MV scoring by one of these 2 protocols ranged between 68 ± 16 s and 110 ± 18 s.
There was no single 3D image by any modality-enabled scoring of MV leaflets and chordae at the same time. For scoring of MV leaflets, 3 recommended protocols were proposed. The first recommended protocol included acquisition of either single- or multi-beat zoom 3D images acquired from PSAX positions within 17 ± 4 s and 21 ± 4 s, respectively. The second recommended protocol included multibeat live 3D images acquired from PSAX position within 21 ± 6 s. The third recommended protocol included multibeat full-volume 3D images acquired from PLAX position within 38 ± 7 s. The total time needed to score MV leaflet by any of the three protocols ranged between 17 ± 4 s and 38 ± 7 s. From PLAX positions, single-beat full-volume 3D images can be included as an alternative protocol within 17 ± 4 s and 21 ± 4 s, respectively. All the 3D images by all modalities did not help in complete scoring of chordal thickness and separation due to incomplete visualization of the distal third of chordae. Thus, there is neither recommended nor alternative protocols that can be used. Single-beat acquisition by all modalities (live 3D, zoom 3D, and full volume) was selected for MV scoring, and the multibeat acquisitions were excluded due to multiple stitch artifacts. Two recommended protocols were proposed. 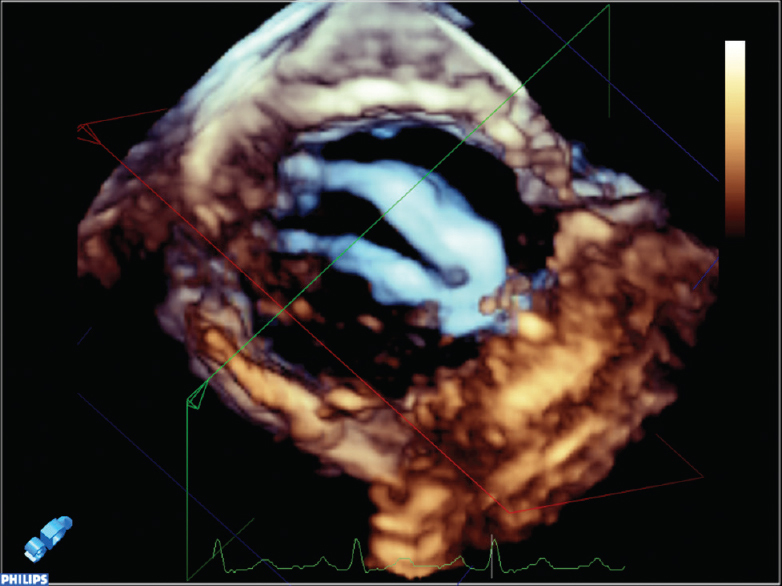 The first recommended protocol included single-beat apical acquisition of 4 zoom 3D images (one image for MV leaflets and 3 images for chordae). The average time needed for MV scoring was 68 ± 16 s. The second recommended protocol included single apical acquisition of full-volume 3D images. The average time of acquisition, cropping, and analysis of single-beat full-volume images was 105 ± 22 s. The total time needed to complete MV scoring by any of the two protocols ranged between 68 ± 16 s and 105 ± 22 s.
One recommended protocols proposed for scoring of MV leaflets included acquisition of single-beat zoom 3D images acquired from PSAX positions within 17 ± 4 s. One alternative protocol included single-beat full-volume images from PLAX within 30 ± 7 s. As in SR, all 3D image modalities were poor for scoring of chordal thickness and separation due to incomplete visualization of the distal third of chordae. Multibeat live 3D images acquired from PSAX (recommended only in SR). The proposed 3D-TTE protocols used one of the latest current standard echo systems and last version of its analysis software. The proposed protocols used all the current 3D modalities. Some of these modalities (zoom 3D and single-beat acquisition) were not available at the time of MV score validation. However, the components of the validated MV score were applied without any change in this study. The 3D image acquisition and valve orientation followed the EAE/ASE recommendation,, but due to advance in the current Q-lab software, the analysis of dataset was modified to include all the available cropping methods. The iCrop was the ideal method helped in complete assessment of MV leaflets and chordae. The iSlice method of cropping has the advantage of displaying multiple cut sections at different levels from single image acquisition. However, the poor image resolution did not help for complete assessment of MV leaflets and chordae in a considerable percentage of patients. The technology of the 3D probe and echo machine has rapidly evolved which shorten the time of image acquisition even with the beginner. The recommended proposed protocols enabled complete scoring of MV in patients with SR within a time ranged between 68 ± 16 s and 110 ± 18 s if the apical window is selected for image acquisition. If parasternal window is selected for image acquisition, scoring of leaflets but not the chordae due to missing of distal third can be applied within a time ranged between 17 ± 4 s and 38 ± 7 s.
In patients with AF, time variability of cardiac cycles creates stitching artifacts with multi-beat acquisition. Thus, only single-beat acquisition was used with lower resolution than multibeat acquisition [Table 3]. The recommended proposed protocol that enabled complete scoring of MV was obtained from the apical window within a time ranged between 68 ± 16 s and 105 ± 18 s. Using the parasternal window, the proposed protocol was obtained within a time ranged between 17 ± 4 s and 30 ± 7 s. Despite the rapid improvement in computer processing software that shortened the analysis time of 3D images, building of the experience is needed to be familiar with the software. In future, the development of new 3D modalities, advancement of probe technology setting, and/or modification of analysis software may raise the need to modify these protocols. The proposed 3D-TTE protocol used the current standard Philips echo systems and latest version of Q-lab software for analysis. The other echo machines and software from other vendors were not tested. However, other vendors are using the same 3D acquisitions (single beat and multibeat) and 3D modalities (live 3D, zoom 3D, and full volume) with some changes in the nomenclature during image analysis. Hence, the proposed protocol can be applied using the other vendors with the need for modification according to their own terms. The proposed protocols of 3D-TTE may facilitate the application of 3D scoring of MV in patients with MS. The proposed protocols had many potential advantages that can help in MV scoring in all patients regardless of echo window and heart rhythm. Informed consent was obtained from all patients before TTE. Wilkins GT, Weyman AE, Abascal VM, Block PC, Palacios IF. 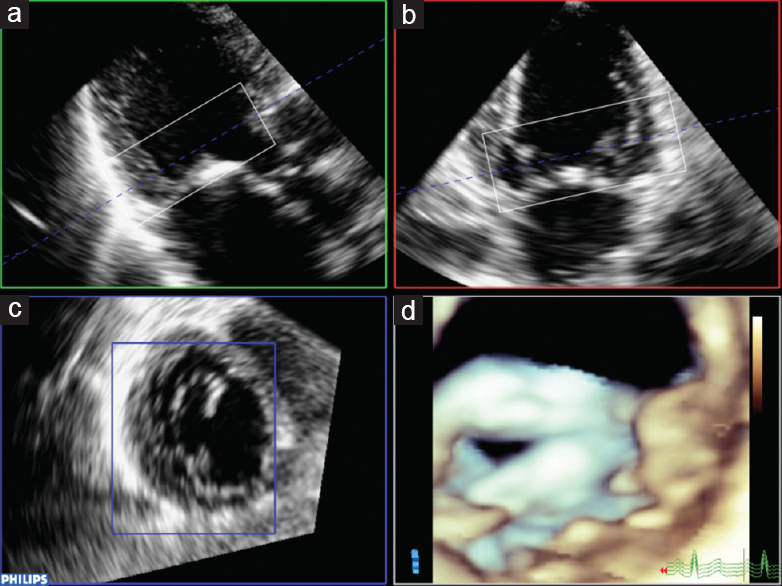 Percutaneous balloon dilatation of the mitral valve: An analysis of echocardiographic variables related to outcome and the mechanism of dilatation. Br Heart J 1988;60:299-308. Chen CG, Wang X, Wang Y, Lan YF. Value of two-dimensional echocardiography in selecting patients and balloon sizes for percutaneous balloon mitral valvuloplasty. J Am Coll Cardiol 1989;14:1651-8. Reid CL, Chandraratna PA, Kawanishi DT, Kotlewski A, Rahimtoola SH. Influence of mitral valve morphology on double-balloon catheter balloon valvuloplasty in patients with mitral stenosis. Analysis of factors predicting immediate and 3-month results. Circulation 1989;80:515-24. Vahanian A. Balloon valvuloplasty. Heart 2001;85:223-8. Goldstein SA, Lindsay J Jr. Do we need more echo scores for balloon mitral valvuloplasty? J Am Soc Echocardiogr 2010;23:23-5. Anwar AM, Attia WM, Nosir YF, Soliman OI, Mosad MA, Othman M, et al. Validation of a new score for the assessment of mitral stenosis using real-time three-dimensional echocardiography. J Am Soc Echocardiogr 2010;23:13-22. Lang RM, Badano LP, Tsang W, Adams DH, Agricola E, Buck T, et al. EAE/ASE recommendations for image acquisition and display using three-dimensional echocardiography. J Am Soc Echocardiogr 2012;25:3-46. Wunderlich NC, Beigel R, Siegel RJ. Management of mitral stenosis using 2D and 3D echo-Doppler imaging. JACC Cardiovasc Imaging 2013;6:1191-205. Byrt T. How good is that agreement? Epidemiology 1996;7:561. Nunes MC, Tan TC, Elmariah S, do Lago R, Margey R, Cruz-Gonzalez I, et al. The echo score revisited: Impact of incorporating commissural morphology and leaflet displacement to the prediction of outcome for patients undergoing percutaneous mitral valvuloplasty. Circulation 2014;129:886-95. Surkova E, Muraru D, Aruta P, Romeo G, Bidviene J, Cherata D, et al. Current clinical applications of three-dimensional echocardiography: When the technique makes the difference. Curr Cardiol Rep 2016;18:109. Navarro MA, Kim M, Salcedo EE. 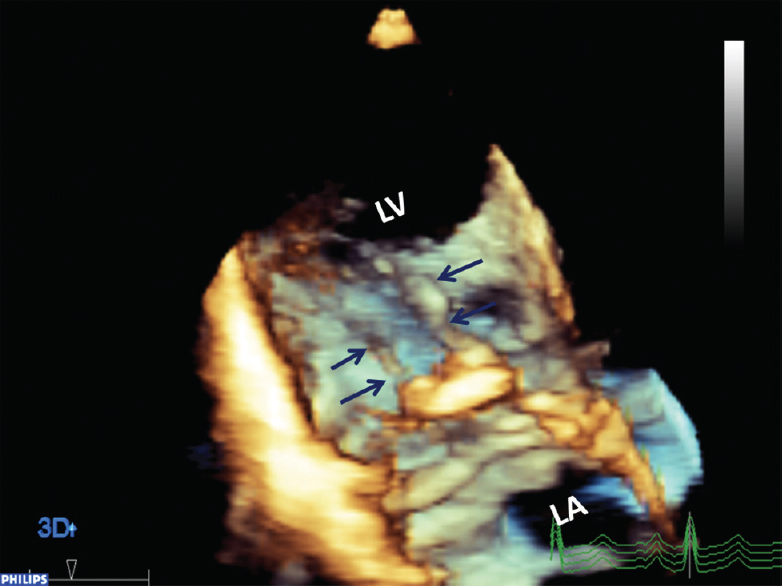 Real-time 3D echocardiography in percutaneous balloon mitral valvuloplasty; Ch. 5. In: Squeri A, editor. Hot Topics in Echocardiography. : InTech London, UK; 2013. p. 101-17.
de Augstin JA, Zamorano J. Mitral stenosis and percutaneous mitral valvuloplasty; Ch. 6. In: Shiota T, editor. 3D Echocardiography Textbook. 2nd ed.,: CRC Press Florida, USA; 2013. p. 71-8. Reményi B, Wilson N, Steer A, Ferreira B, Kado J, Kumar K, et al. World heart federation criteria for echocardiographic diagnosis of rheumatic heart disease – An evidence-based guideline. Nat Rev Cardiol 2012;9:297-309. Lang RM, Badano LP, Tsang W, Adams DH, Agricola E, Buck T, et al. EAE/ASE recommendations for image acquisition and display using three-dimensional echocardiography. Eur Heart J Cardiovasc Imaging 2012;13:1-46. Soliman OI, Anwar AM, Metawei AK, McGhie JS, Geleijnse ML, Ten Cate FJ, et al. New scores for the assessment of mitral stenosis using real-time three-dimensional echocardiography. Curr Cardiovasc Imaging Rep 2011;4:370-7.